A movement of a Beethoven string quartet, lost in 1799, is to be given its premiere in Manchester on Thursday, after its discovery and reconstruction by Barry Cooper, professor of music at the University of Manchester. The original slow movement of Beethoven's Quartet in G, Op 18 no 2, was written in 1799 when the composer was 28 years old, for his Bohemian patron, Prince Lobkowicz. It was only his second string quartet and, when he had completed a group of six such works – the Op 18 quartets – he went back to the two first and revised them substantially in 1800, discarding the whole of the second movement of the quartet in G.
The original slow movement exists in the form of fragmentary sketches – often with only music for the higher instruments written out in full, and not in sequential order. But Cooper has, he said, "made the jigsaw fit, and also made it performable" – that is by working out the correct order for the music, and filling out the lower musical lines that Beethoven left blank. "What we have now is something like – not exactly like, but pretty similar to – what Beethoven wrote," said Cooper. The movement as revised by Beethoven begins with a smoothly flowing, intense melody with an elegantly decorated first violin line, followed by aplayful, fast central section. But, according to Cooper, Beethoven's first thoughts were rather different. Though the gorgeous melody of the revised version is not dissimilar to the original, the first version has three rather than four beats to the bar. There is also a quite different middle section, in C minor – "stormy, angry, with shimmering tremolandos and rushing scales, very tense and anguished", according to Cooper. "There's also a lovely modulation where he takes you through some weird keys very quickly." It is a matter of speculation why the composer decided to change the character of the movement so radically. "It is possible that it too much anticipated the stormy mood of the C minor quartet," said Cooper, referring to the fourth quartet in the Op 18 group. Cooper tactfully refused to be drawn on which version was the better. "They both have an enormous amount to offer," he said. "It's like asking whether you prefer apples or oranges: they are different. 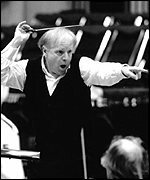 Any other composer would have been pleased with the first version – but Beethoven was a perfectionist." The premiere will be given by the Quatuor Danel at a seminar open to the public at the University of Manchester. 2011, September 28. 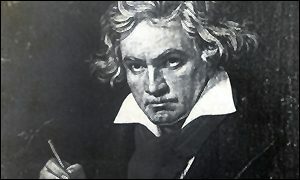 'Lost' Beethoven work to be aired. A "lost" Beethoven movement is to be performed for the first time in more than 200 years, after being pieced together from early drafts. Beethoven wrote the slow movement for his string quartet Opus 18 Number Two in 1799 before discarding it and composing another version a year later. The original has not survived, but has now been reconstructed by Prof Barry Cooper of Manchester University. He has reassembled the surviving sketches, filling in any gaps himself. Prof Cooper, one of the world's leading experts on the composer, said preliminary sketches from Beethoven's notebooks had survived for all 74 bars of the movement. But half of the bars were written for just one instrument, meaning Prof Cooper has completed the missing instrument parts himself. "You've got a pretty good idea of what the music is like," he told BBC News. "The movement will certainly be strikingly similar to what Beethoven wrote. Obviously it can't possibly be exactly the same." The original movement was delivered to Beethoven's patron Prince Franz Joseph Maximilian von Lobkowitz in 1799 before being replaced with a revised version. The full manuscript of the original composition has not been seen since. But Beethoven wrote to a friend in 1801, telling him that he had not mastered the composition of quartets at the time that he wrote the original. "He was a perfectionist," Prof Cooper said. "He felt that when he wrote this early movement, he didn't actually know how to write quartets. Any other composer would have been delighted to have written this lovely movement." The completed movement will be performed by the university's resident string quartet Quatuor Danel at the Martin Harris Centre in Manchester on Thursday. The performance comes 13 years after Prof Cooper stirred controversy in the classical music world by creating a 10th Symphony based on unfinished Beethoven sketches. He said there was "far more" evidence for the contents of the string quartet than for the symphony, meaning it was "much easier to piece together". An overture constructed from an unfinished work by Beethoven will get its première in Washington next month. The German composer began writing the overture to an opera based on Shakespeare's Macbeth in 1810 - but it was abandoned and left unperformed. But a Dutch composer and computer programmer has pieced together parts from collections across Europe to create the eight-minute piece. "The opportunity to give the world premiere of a Beethoven composition - even a small portion of it - is astonishing," said National Symphony Orchestra music director Leonard Slatkin. "Aside from the intrinsic interest in anything Beethoven wrote, the story of how this performing version came to exist would probably be viewed as too far-fetched if it were to appear in fiction." 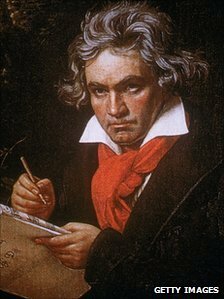 Ludwig van Beethoven began writing the overture with Austrian librettist Joachim von Collin - but abandoned the work when von Collin pulled out, complaining the music was "too gloomy". Sketches of the overture were broken up by souvenir hunters after Beethoven's death in 1827, and ended up in Bonn, Berlin and London. Dutchman Willem Holsbergen decided to let the work see the light of day after hearing of its existence from another fan on a website. Holsbergen typed notes from the sketches into a special computer programme, which helped him stitch the three parts of the work together. "It was very exciting when the piece sprang together for the first time, when it came to life," Holsbergen said. The work is "pretty dark music most of the time", Holsbergen said, but there are "points of light in it as you would expect from Beethoven". It had not been difficult to put the pieces together, he said, and described it as "great fun and a great honour" to construct the work. The overture was intended to accompany the first part of the Macbeth story, where the three witches are talking. Holsbergen's score will use two flutes, two oboes, two clarinets, two bassoons, four horns, two trumpets, timpani and strings.